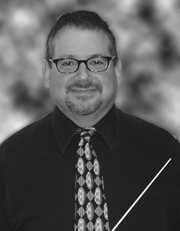 Roger Grodsky is a tenured professor of musical theater at the University of Cincinnati College-Conservatory of Music (CCM) and is the musical director and vocal coach for CCM’s musical theatre training program. He has served as musical director and conductor for CCM's productions of Oklahoma!, Passion, Spring Awakening, Hello Again, Anything Goes, Two Gentlemen of Verona, Wonderful Town, The Pajama Game, Cabaret, On the Town, The Mystery of Edwin Drood, The Boys from Syracuse, Songs for a New World, Candide, Dracula: The Game of Love (world premiere), Grand Hotel, My One and Only, Man of La Mancha, The Secret Garden, The Hot Mikado, Cyrano and Babes in Arms, among others. Grodsky has also supervised CCM’s frequent appearances with the Cincinnati Pops (Erich Kunzel and John Morris Russell, conductors). Their collaboration, Patriotic Broadway, was televised nationally on PBS and a CD was recently released of the Pops’ Superheroes! Concert. He created and directed CCM’s widely praised production The Revue Review and has published the first in a series of articles for The Absolute Sound entitled “Golden Age Broadway Musicals on Record.” While on the faculty of the Boston Conservatory, he conducted Sweet Charity, The Human Comedy, Nine, Grand Hotel, Ruddigore, Assassins and High Button Shoes. For six years he served as musical director for Harvard University's Hasty Pudding Theatricals in Cambridge, Massachusetts. Mr. Grodsky has conducted national tours of Cabaret, My Fair Lady and Hello, Dolly! As well as The Most Happy Fella with the original Broadway revival lead, Spiro Malas. For several summers he has worked for the Rodgers and Hammerstein Organization in New York City on the restoration of select shows (including The King and I, Oklahoma!, Too Many Girls and The Boys from Syracuse), many of which were performed around the world in honor of Richard Rodgers’ centennial birthday celebration in 2002-2003. In 2003, he adjudicated America’s Junior Miss, which was broadcast nationally. In 2009, he presented a paper about his restoration work at the Song, Stage and Screen IV Conference in Washington, D.C.
BM, University of Wisconsin-Madison .